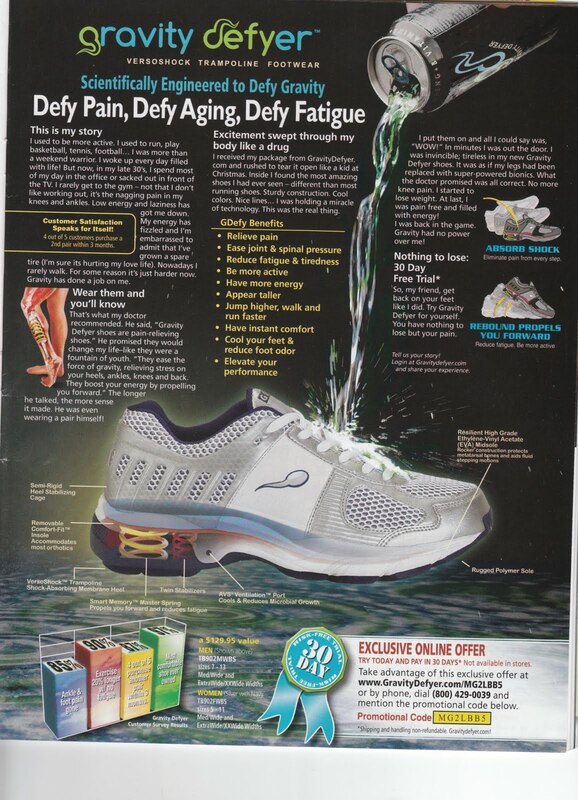 In my tradition of examining science-y shoes, I'd like to talk about these sneakers, the Gravity Defyers. I found this advertisement in a magazine called Invention & Technology, which seems (if all the ad space dedicated to commemorative coins is any indication) to be targeted at an older demographic. The logo on the shoe is sort of like a Nike swoosh, but a little more...swimming. Is this an accident? A joke? A tadpole? It's hard to say. Low energy and laziness has got me down. My energy has fizzled and I'm embarrassed to admit that I've grown a spare tire (I'm sure it's hurting my love life. )...Gravity has done a job on me. On receiving his shoes in the mail, our hero says, "Excitement swept through my body like a drug!" Sturdy construction. Cool colors. Nice lines...I was holding a miracle of technology. This was the real thing. He was understandably eager to experience all the benefits of Gravity Defyer shoes, which "Relieve pain," "Elevate your performance," and "Be more active." I put them on and all I could say was, "WOW!" In minutes I was out the door...I was back in the game. Gravity had no power over me! 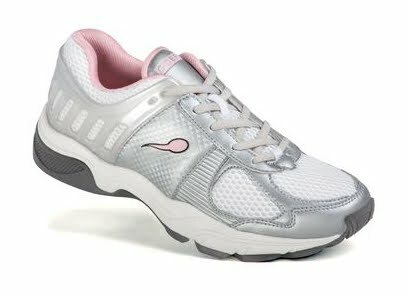 A pair of these amazing shoes can be yours for only $129.95 (energy drink pouring itself all over your foot not included). Ladies, don't feel left out--there's something for you, too! "Customer Satisfaction Speaks for Itself." This is disturbing on many levels. THANKS!